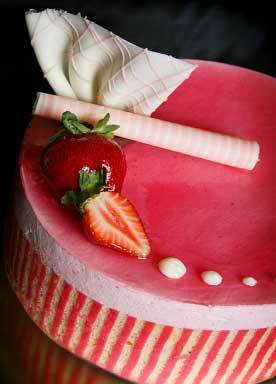 Decorative jaconde banded sponge, moistened with strawberry liquor combine in a most delicious way with our light and creamy strawberry baviour. Layers of almond sponge, coffee buttercream and chocolate ganache make up this classic. Combining the flavours of pistachio and chocolate in a European styled cake.